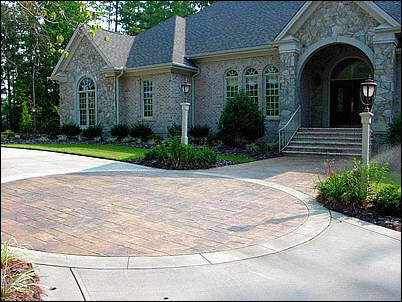 Concrete Driveways are the most used material when it comes to driveways because of its unique durability. Here are the top 5 benefits to using concrete for your driveway: Cost Efficient- concrete is affordable for everyone and it is semi-easy to install. Simply washing it one a week will also save a lot of. Style- With many stains on the market that are compatible with concrete, you can achieve almost any color. Flexibility- You can create any shape with concrete, easily repair it. Tough! – Concrete is said to be able withstand tough weather conditions, heavy loads like traffic, and can also withstand scratched etc. A method called stamping is used to transform regular grey into a replica of natural stone, pavers, or brick for a fraction of the cost. 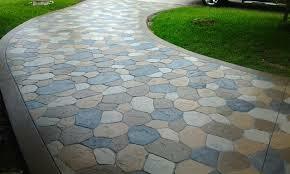 Custom designs can also be created on a concrete driveway to give your home a unique entrance. To maintain your concrete so that it looks nice for years to come, some precautions must be taken by you the homeowner and the contractor. It is always very important to find a good contractor that you trust and believe is knowledgeable about the work. Of course, to ensure that your concrete driveway will look good for many years to come, there are important steps your driveway contractor should follow during installation. How well your driveway looks and performs long-term is largely related to the quality of workmanship and materials that go into it. To help ensure a problem-free driveway, be sure to read our overview of driveway construction basics. Once you become the proud owner of a concrete driveway, it won’t take much effort on your part to keep it looking its best for many years to come. Read our tips on how to care for and maintain a concrete driveway. Finally, if you’re concerned about the environment, concrete is one of the “greenest” materials you can use to build a driveway.